If you’ve ever wondered what it would be like to go back to school and fulfill your dreams of running with the popular crowd, take a cue from 82-year-old Frances Wood. The grandmother of eight decided to pack her bags and go back to college, feeling lonely and depressed after the passing of her husband of 59 years. She enrolled at MidAmerica Nazarene University, a liberal arts college just south of Kansas City, where people over the age of 65 can take classes for free. The campus is 70 miles from her house so she rents an off-campus apartment. She’s a sophomore, but not working toward a degree so she has no major — unless you count majoring in fun — and is currently taking classes about personal finance, federal income tax, Kansas history and the writings of John. Wood expected to expand her mind, but she didn’t expect to expand her social circle to such an extreme — quickly becoming the most popular “girl” on campus. Granny Franny, as she is known, even scored three dates to Homecoming — though she insisted on being named Honorary Homecoming Granny instead of Homecoming Queen, as the kids wanted to name her, because she didn’t want to take the experience away from a young person. And she bought her own ticket. “I needed something different to do… and this is different,” Wood told TODAY’s Joelle Garguilo. It certainly is. You’d be hard-pressed to find someone among the student body of roughly 1,700 students who hasn’t heard of Wood. “When you bring up Granny Franny, their eyes light up,” one student said. “We were just drawn to her, it was magnetic almost,” said another. It’s hard to believe, but Wood says she wasn’t part of the popular crowd in high school or college and, in fact, dropped out of college the first time around after meeting her husband. Before she got to campus this time, she was so nervous about making friends her grandkids recommended making business cards and handing them out, which she did, with the name Granny Franny. On top of acing her studies, Wood also finds time to pull pranks on fellow students and, yes, party. 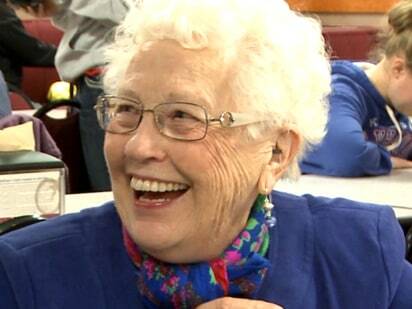 Her classmates threw her a surprise 82nd birthday celebration and even created a Granny Franny Ping Pong Invitational in her honor.